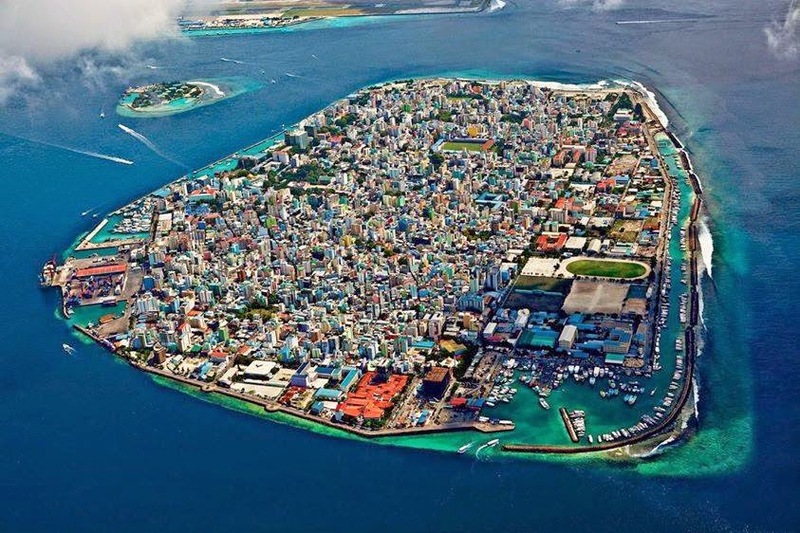 Home » beauty » island » maldives » nature » Amazing view of Male, capital of the Maldives. The Republic of the Maldives is an independent country made up of a double chain of 26 atolls which form many small islands. If you look on a map you will find the Maldives situated in the Indian Ocean. The country is located off the southern coast of India and Sri Lanka. The tropical setting of the Maldives makes it a popular destination for tourists. Here are some facts about the geography of the Maldives. The Maldives, also called the Maldive Islands, is made up of coral atolls forming 1,192 small islands. The capital city is Male. These islands cover 35,000 square miles of the Indian Ocean, but their total land area is only 115 square miles. The Maldives is primarily covered in white, sandy beaches. The highest point in the Maldives is located on Viligili island and is less than eight feet above sea level. The rest of the country is at, or slightly above, sea level. There is a large variety of marine life surrounding the country. The location of the Maldives makes it vulnerable to tsunamis. Six islands of the Maldives were completely destroyed after the Indian Ocean tsunami in 2004, and 14 were made uninhabitable. The Maldives lies in the Indian Ocean and has a warm, tropical climate with hot and humid weather at all times. Year-round temperatures generally remain between 75 and 91 degrees Fahrenheit. The average temperature in winter is 73 F. In the summer, temperatures in the capital average 84 F. The dry monsoon season is typically between November and March. The wet monsoons arrive between June and August and can bring up to 150 inches of rain during the summer.